"A great recipe for a brunch. I've even made it as a dessert! A wonderful combination of chocolate and cinnamon." Preheat oven to 350 degrees F (175 degrees C). Grease a 9-inch springform pan. Combine flour, baking powder, baking soda, and salt in a bowl. Beat butter and cream cheese in a large bowl with an electric mixer until well-blended, about 30 seconds. Beat in 1 1/4 cups sugar and vanilla extract until mixture is light and fluffy. Add eggs one at a time, allowing each egg to blend into the butter mixture before adding the next. Pour in the flour mixture alternately with the milk, mixing until just incorporated. Fold in chocolate chips; mixing just enough to evenly combine. Pour the batter into prepared pan. Mix pecans, 1/4 cup sugar, and cinnamon in a small bowl; sprinkle over batter. Bake in the preheated oven until a toothpick inserted into the center comes out clean, 50 to 55 minutes. Cool in the pans for 10 minutes before removing to cool on a wire rack. Serve warm. I had fat free cream cheese in the house so I used it. The cake was good but dry. 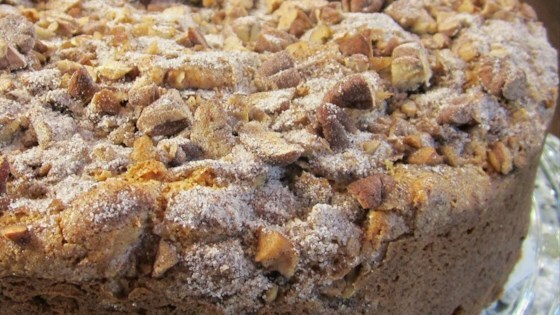 This is a deliciously rich coffee cake that we thoroughly enjoyed. I guarantee this will be on the menu for my next brunch with friends. They’ll love it. Thanks for sharing! Was hungry for a coffee cake and was also craving chocolate so I searched and this recipe came up. Excellent taste!! Used walnuts instead of pecans. Will definitely make this again.